Going into and out of manual mode when custom quilting. When custom quilting, I try to minimise the starts and stops. On a quilt where I need to do manual quilting but want iQ to stitch most of the rest, I set up my stitching sequence so that I can easily switch between computer control and human control. In this video I show how I do that, by choosing stop to cut threads as a transition between the sequenced patterns that iQ will stitch. I can only do this because of iQ's unique drive motors. If I had to undo belts then re-enagage them, it would be more difficult. 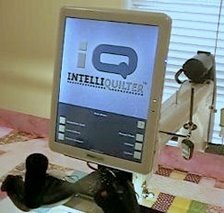 While seasoned iQ users know this, I thought this video might help new owners as well as demonstrate the advantage of iQ's drive wheel system to those thinking about buying a computer system for their quilting machines.